Jonny Copp and Micah Dash were two of America’s leading alpine climbers, adventuring to the farthest corners of the world in search of first ascents in the purest of style. It was on just such a mission in May 2009, in western China’s Sichuan province, that Jonny and Micah, along with filmmaker Wade Johnson, were killed in an avalanche. With Jonny and Micah’s deaths we lost two of the great alpinists, characters and storytellers the North American climbing world has recently known. Jonny and Micah believed the summit meant something, but style was everything. They pursued climbing in the same manner they lived—with vigor and passion, and with a strong desire to share their adventures with the rest of the climbing world through photographs, videos and slideshows. The Copp-Dash Inspire Award has been formed, therefore, to support climbers who choose to follow a similar path, both in life and in the mountains. Sponsored by Black Diamond Equipment, La Sportiva, Mountain Hardwear and Patagonia, and with in-kind support from Adventure Film Festival, Alpinist Magazine, American Alpine Club, Sender Films, and the Jonny Copp Foundation, the Copp-Dash Inspire Award will help support small teams tackling difficult climbs in the great mountains of the world who plan to personally document and share their ascents through a multimedia blend of storytelling elements. The Copp-Dash Inspire award will provide a pool of $20,000 in grants to North American climbers for expeditions between May 1st and February 28th every year. The fund’s goal is to assist climbers before, during, and after expeditions with financial grants and multimedia instruction to help empower them to share their current and future adventures with a wider audience. 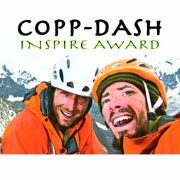 The Copp-Dash Inspire Award is sponsored by Patagonia, Black Diamond, La Sportiva, Mountain Hardwear, and The Jonny Copp Foundation, with in-kind support from Adventure Film Festival, Alpinist Magazine, American Alpine Club, and Sender Films.